The Holy City was annihilated when the great Demon Lord invaded. Through the sacrifices of countless noble lives, evil was eventually defeated, but the ruins left behind gave the survivors little to celebrate. The people were determined to rebuild the Holy City and surpass its former glory in order to honor those who perished defending it. However the reconstruction process has been long and arduous, after all, the original Holy City was not built overnight. The Mage Council has recently unveiled a new plan to hasten the restoration of the once grand Magic Capital. The news has been met with much enthusiasm and people have started gathering resources for the effort. Thankful for the support of the people, the Council has decided to reward the most devoted with the highest praise and honor. Maybe even the gods will favor them! 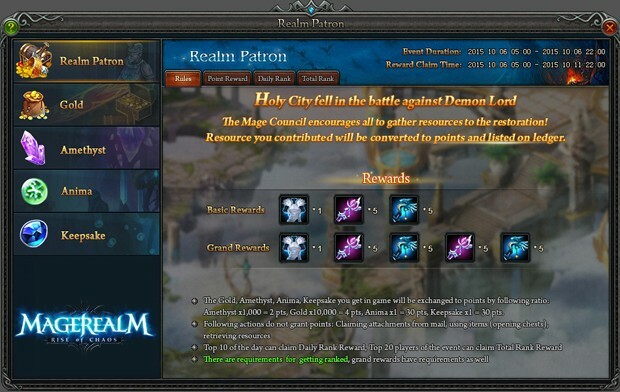 The Mage Council encourages everyone be Realm Patrons and gather resources for the restoration of the Holy City. When players earn specific resources throughout the game, they will gain points that will be tallied on a ledger. Players will be ranked based on these points and rewarded accordingly. 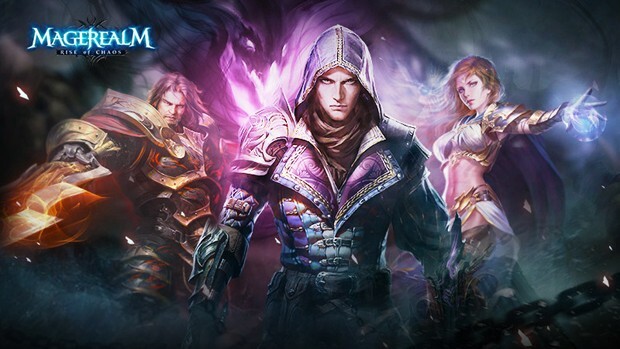 Show your devotion to the Realm and bring glory back to the Holy City! Points are given when resources are gathered. Players do not need to trade in resources for points. The more you play, the higher your points! The following actions do not grant points: Claiming attachments from mail, using items (opening chests), retrieving resources. The Top 10 Realm Patrons for the day can claim Daily Rank Rewards. The Top 20 Realm Patrons of the entire event can claim Total Rank Reward. There is a minimum contribution amount needed to be ranked, and extra gifts have additional requirements as well.